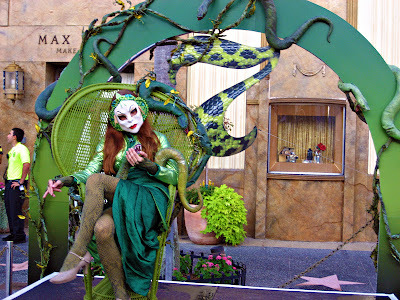 After a fun-filled day of gorging and thrill-riding at Universal Studios Florida (previous post), I stuck around for Halloween Horror Nights 21, winner of the Golden Ticket Award for 2011's Best Halloween Event in the Country by Amusement Today! 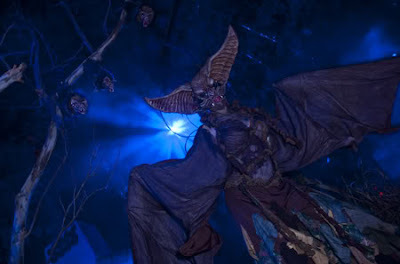 What began as Universal Orlando's three night, one haunted house event in 1991, has since been extended to the Hollywood location and up to 25 nights, 8 haunted houses, 6 scare zones (outdoor themed areas, featuring costumed characters and special effects intending to scare people on their to the haunted houses), hundreds of frightening “scareactors,” and 2 live shows that have included "The Rocky Horror Picture Show: A Tribute" and "Bill and Ted's Excellent Halloween Adventure." Especially if you’re a fan of horror films, this is a don’t-miss event for those looking for something a little edgier than Disney; it's definitely geared towards teens and adults. 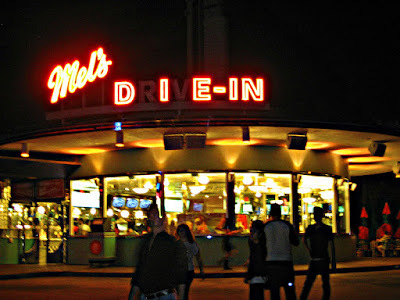 Halloween Horror Nights has amassed a number of characters, known as icons, some being original creations and some using licensed characters, usually having elaborate back-stories that involve the event's theme, houses, or scare zones, predominantly used for promotional materials and merchandising. 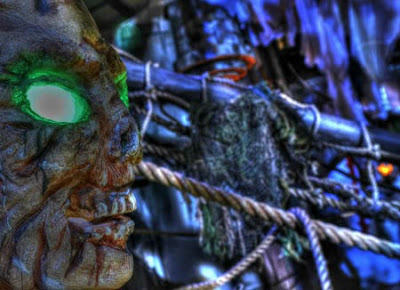 The first unofficial icon was the Crypt Keeper, followed by characters Jack the Clown, Bloody Mary, and Fear, among others. This year, they will scream as they become prey to fiendish creatures, panic as they come face-to-face with a horrifying "thing," feel chills as they are haunted by deceased souls – and watch in paralyzing fear as Lady Luck, this year's icon, transforms from a tempting seductress to a bloodthirsty beast. View the officially creepy commercial here. I had the option of temporarily leaving the park until 6:30 or waiting at Finnegan's Bar from 5 to 6pm, while park staff switched everything over for the event. I chose the latter, letting the time breeze by with a pint of Bud and the company of other excited horror fans that crowded the busy bar, which soon became standing-room only for the vast majority. 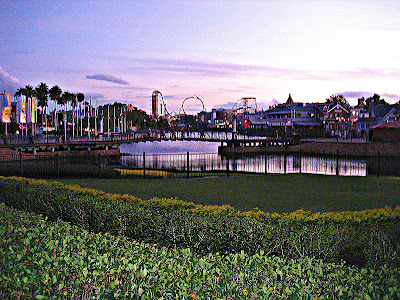 Upon being unleashed into the terror-transformed streets of Universal, I bought an Express Pass, which entitled me to one admission to the Express line of each haunted house and select rides. I figured since it was Thursday (the event closes 2 hours earlier than on the weekends) and I wanted to get through every haunted house and scare zone, and because I might never have the experience again, it was worth the extra money, so I shelled out another $40. I was right, because with it I practically walked right into all 8 houses (many times I did), avoiding waiting up to an hour in the regular lines, even having time to re-do some! Saws N' Steam: Into the Machine - Spinning blades and massive, crushing pistons await you around every corner as you are forced deeper into the bowels of a mechanical nightmare. 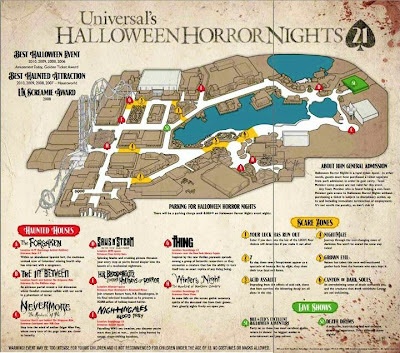 At the end of last year, Universal added a scare zone in the middle of the event and this year brought it back and expanded on the idea. In the beginning you are told the lie that you are about to enter a utopian society, the Horizon. It turns out that going into the Horizon really means you are going into the machine. The machine squeezes out every ounce of liquid out of its victims so they can turn that into steam to power the machine. The Thing - Paranoia spreads like an epidemic among a group of researchers in an isolated Antarctic outpost as they are infected, one by one, by a horrifying creature from another planet. In a place where there is nothing, they found something. Based on the prequel movie: The Thing, Universal Creative worked closely with Universal Pictures to make this house as accurate as possible to the movie. The creatures' molds are the exact same ones that were used to create the creatures for the film! The Forsaken - Four ships began Columbus's fateful voyage, only three became legend. Condemned to a watery grave, the mutinous and cursed crew of that 4th ship has returned with a vengeance, for within the walls of a Spanish fort, a maelstrom has brought from the depths...death itself. H.R. 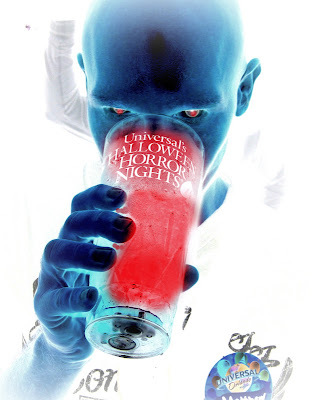 Bloodengutz Presents: Holidays of Horror - Join creature feature host, H.R. Bloodengutz, in his final televised broadcast as he presents a scare-athon of holiday-based horror that is guaranteed to cleave you screaming for more. You'll walk through many different holidays scenes, but they're not quite the way you remember them, as you witness the Feaster Bunny, Thankskilling, Valentines Day, Arbor Day, Christmas, and the Luck of the Irish. The In-Between - An ominous portal reveals a 3rd dimension where all is not what it seems: a realm where our world and another collide. 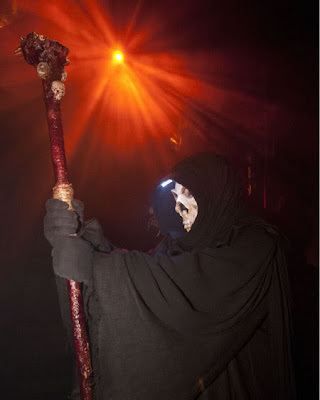 Surrounded by fiendish creatures, your eyes will deceive you with every step through this phantasm of terror. This house is done in 3D and is this year's fun house, with well-timed cool effects, and done in bright neon colors that pop off the wall and props that make it feel like you are walking into another dimension, especially in the last room. Nevermore: The Madness of Poe - Step into the mind of the iconic writer, where every turn of the page takes you closer to the brink of insanity. It really pays off having read Edgar Allen Poe's greatest works, because the house brings those writings to life. Each scene in the house pays tribute to a different story. In the beginning, you see Poe starting on his drinking binge and beginning his works. 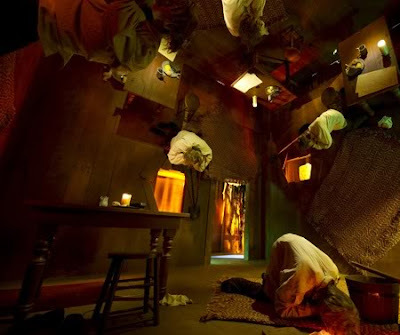 As you continue through the house, the stories in each of the rooms get more intense as Poe gets crazier and more drunk. Nightingales: Blood Prey - Within every war, the Nightingales have appeared. Able to transform themselves to fit any setting, these savage banshees feed on the weak and the helpless. Patrolling WWI era trenches, you discover that you are more than just at war…you're being hunted. Winter's Night: The Haunting of Hawthorn Cemetery - As snow falls on this normally serene gothic cemetery, the deceased souls that occupy its confines have their sights set upon you, insuring that the chill you feel up your spine is more than just the cold of night. Now one would think that after 20 years of running this event, Universal would have done a house based on a haunted cemetery, but this is actually the first year that Universal Orlando has done a house like this. Be sure to pay attention to the names on the tombstones, you might recognize a few like the Brady Bunch and some of the creators of Halloween Horror Nights. Canyon of Dark Souls - Upon entering into the Canyon of Dark Souls, you will feel like a small speck of humanity as the overwhelming sense of death surrounds you. Creatures that dwell within the Canyon are not welcoming so walk slowly as to not disturb them. Adding to the canyon experience are the fire effects that go off high above your head to help create a feeling like you're on your way to to Hell. Acid Assault - For decades now this apocalyptic-looking city has been degrading from the effects of Acid Rain that still falls today, caused by factories which sprung up on the city's edges during the 20th century. Those that have lived and survived the blistering decay are all alone in the city. Survivors have stripped the city of all life to sustain their own. 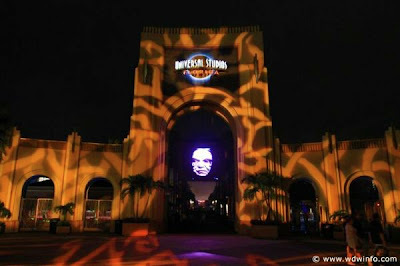 Enter if you dare, into the most impressive, innovative undertaking to date at Universal Orlando's Halloween Horror Nights, using building projection to make it appear as though acid rain is literally making the buildings crumble before your eyes. Grown Evil - Enter, if you dare, into our garden where Evil grows. Nature has taken this once well manicured sanctuary back from the humans who once kept it. Now the creatures that inhabit the garden are making any human that enters their prey. The heavy fog is so thick you can barely see in front of you, let alone see what's about scare the crap out of you. 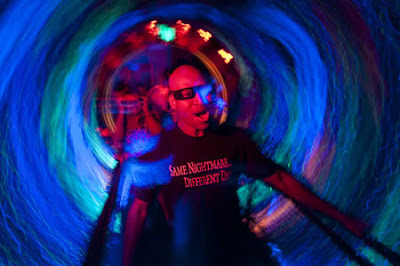 NightMaze - Journey through the ever changing maze of darkness. This all black maze will morph and shift as you walk through it. You will not be scared the same way twice. Your Luck Has Run Out - Enter if you dare into the lair of the lucky, where you'll find Lady Luck in both her normal and morbidly morphed forms. Your choices will determine if you make it out alive. Will she choose you to be her next victim? I ended the night with Bill & Ted's Excellent Halloween Adventure 2011, "a live-action comedy/dance show starring Bill & Ted as they rely on parodied pop-culture icons over the past year to save them from whatever trouble they have gotten themselves into this time. This is a crass, loud and adult themed show, so if you are lacking a sense of humor, this isn't for you." The jokes were kind of lame; the highlight was the pumped-up dance routines throughout the show and at the end.